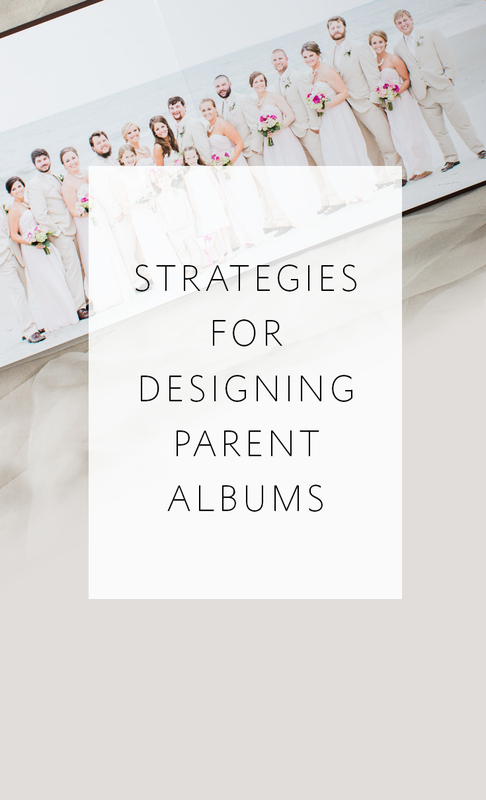 Last week we talked a little bit about parent albums and the benefits for offering them. In that post, we touched on how offering exact duplicate copies of the bride & groom's album requires very little extra work for photographers because the design work is already done! While that strategy keeps things simple, some clients desire to have the ability to customize their parent albums. So what is the best approach when your client is asking for alterations to the original design for their parent albums? Today we are going to break down the design/revision strategies successfully used here at Align to help photographers just like you painlessly create multiple album designs for the same wedding...without anyone losing their minds! Here is a list of how Align can help you maximize your profits with minimal extra work for you, the busy photographer! The most direct and simple option is that clients order an exact duplicate copy of the bride and groom's design, typically just in a smaller size that has the same proportions. This would be appropriate when there are NO requests for modifications. Many album printing companies will even allow you to order a smaller album using the exact same design files you uploaded for the large version (i.e. using 12x12-sized layouts to print an 8x8 copy as well). However, if your album company requests separate files for each version, just reach out to your Align designer! Depending on the size you need, we may be able to export the new files immediately or we can use another revision round to resize your design. Every Align Album Design order includes 3 rounds of revisions in the price. Once the bride & groom's design is approved, you can use any unused revision rounds to allow the parents to submit their changes. As long as you don't use more than 3 revision rounds total, there is no additional charge! But if you need more than that, the cost is $50/round which is still typically less expensive than placing a new album design order. Alternatively, if you know for sure that ONLY ONE spread will be changing between the versions (such as the family portrait spread), we could simply design multiple versions of that one spread from the start (at our usual $8/spread price). For example if you need three versions of a 15 spread album, Align could actually design/bill/deliver 17 spreads total. And then you would place three separate orders with your print company and just switch out which version of the family portrait spread you upload to them. Some clients like to place separate design orders for each album. This is the best method if any of the following circumstances are in play concerning the albums: they utilize different image collections, they have different dimension ratios, they require different design styles, they won't have many spreads in common, etc. This is also the method to use when you simply want a fresh start after you finish the original design. As you can see, depending on which approach best fits your workflow/client needs, there is a way to keep the design work simple while still giving your clients exactly what they want. There is nothing quite as satisfying as knowing you have delivered an amazing product and service to your client while paying close attention to their unique requests. At Align, we are more than happy to help you achieve this end goal! We hope you've found these tips helpful! ----------> If you want to give outsourcing a try, click here to find out more about the design styles that Align offers. We have 3 standard design styles but can definitely customize to meet most needs. So don't hesitate to send us examples of designs you like and let us know what your preferences are, and we will design to those specifications. After you take a look at our design styles to find out which one would work best for you, click here to sign up for an account with Align. When you do so, we'll send you a free welcome gift -- our "Top 10 Most Popular Album Companies" Resource List. That way you can find out which album printing & binding companies are the most popular among photographers who use Align, and more importantly, WHY. We'd love to be a part of creating beautiful heirloom albums for your studio and clients!